As a young child I acknowledged God’s existence, but I didn’t understand who or what God is: someone that watched over me, a being that was everywhere I went, or a force very far away. Needless to say, the farthest my faith education went was the show “Veggie Tales.” My family did celebrate Christmas however it was more out of custom than the celebration of Christ’s birth. My parents’ focus was raising me to be a kind, intelligent, and thoughtful person, which can be achieved without a faith upbringing. Ironically, they were not raised that way: both of their upbringings were centered around God. My mom was born and raised in Shorewood near where I currently live. She and her two older brothers were taught the Catholic faith. My dad, on the other hand, was raised Muslim. Born in Cairo, Egypt, my dad immigrated to the United States at the age of four. For both of my parents, faith was a very large aspect of their lives, and just the thought of marrying one another seemed so abstract. Although they idolized the same God, the idea of a Catholic and a Muslim dating—and later marrying—seemed strange on both sides. Over time both families opened their hearts to one another and quickly learned how incredible not only the individual was, but their family was as well. When it came time for mine and my siblings’ upbringing, faith was not the foreground. And it did not concern me until I reached middle school. Throughout the years I have juggled ideas of atheism, undeveloped versions of Christianity, Agnosticism, Deism, and more. When I came to Dominican High School, nothing scared me more than faith. I could make friends and get good grades, but I cared so much about not revealing to people I wasn’t Catholic. My dad’s biggest concern was that my beliefs shaped simply because of those around me, and I am sad to admit that they did. Although I may have developed understanding of some aspects of the Christian faith, I really didn’t believe any of it to be true. The issue was that while I was trying to open my mind to God, I was also trying to prove myself to my school and friends. I demonstrated some internal conflict I had to them, but many did not understand. They didn’t get that my faith was not integrated into every single aspect of my life growing up. Once when I was trying to explain this to my friend, she responded by saying “Amira, God is real. He just is.” But she didn’t understand that that was not enough for me. And if I did decide to develop a faith, why is it automatic that I turn to Christianity; I should get the chance to explore other denominations as well. All of it was easier said than done. In time my faith grew, and I could discuss and debate it with my friends; we all broadened each other’s perspectives. What really established my faith was my Junior Kairos retreat this past fall. The retreat opened my eyes to the incredible talents of myself and my peers. Additionally, I learned that God places obstacles in front of you that he knows you can conquer; this idea was put to the test the day I returned from the retreat and had to learn a new role for Dominican’s fall show in ONLY 6 days. This challenge tested my strength and capabilities, yet I rose above it. Without my renewed faith I do not know if I could I overcome that obstacle. Faith is a very personal thing. Although I accept many Catholic beliefs, I would not call myself a Catholic. Throughout the rest of my life I know that my faith will alter, evolve, and may change entirely. Over the next few months I will share with you a monthly blog about how my faith is evolving especially during my senior year in high school. Who knows how my faith will be impacted by school work, retreats, school activities and the planning of my post high school life? No matter what happens; what will never change, no matter the faith, is that I know humans must treat each other with compassion, equality, and tolerance. What has influenced your journey of faith? What makes you proud of your faith tradition? What questions or uncertainties do you have about your faith tradition? Laura Gilmartin Hancock is the Campus Minister at Messmer High School. She is blessed to be accompany young people as they grow in their lives of faith, service, and leadership. I've been thinking a lot about transitions lately. I'm not totally sure why. I don't think I'm in the midst of any great life transitions... at least not that I'm aware of yet. I mean, I know that as an educator I'm in the (awesome!) transition between one school year and the next (hello, summer vacation!!). I also know that I've just completed a major project that took years to move from the visioning stage into a lived reality. So, I do have a sense of needing to reflect on the fullness of that experience, and to consider what the impact that this project will have, not only on my personal world view, but also on how it will impact what I do as a professional. But, beyond these two contexts, I have been unsure why "transition" has been such a strong word for me lately. I'm not getting married. I'm not changing jobs. The size of my family is not changing. I'm not going off to start college or to live in a new city. I mean, these are the major transitions of life, right? I'm not in any of them! And still, none the less, "transition" is with me. So, instead of fighting against the word and declaring to be irrelevant at this stage of my life, I've been praying with the word and watching it rise up in my consciousness. And as I've done so, I've come to realize that I need to transition from the person I was in the world yesterday, or last year, or five years ago, into the person who is needed in the world today. I think as an educator and as a parent I am completely comfortable with thinking of transitions within the context of developmental milestones. I've definitely exclaimed, "Ooooh, will you look at that?? My baby started walking today!!" Or, as an educator, I have transitioned from one unit of study to the next and am trained to look for the signs of readiness and proficiency. Or, even looking back at my own personal growth, I vividly remember the transition from college student into... ??? what will come next for me? This developmental transition is part of the beauty of a gap year program like 12 plus 1 for young people who are struggling with identifying their personal transition into, "what's next?" But, putting all of this aside, I think the reason the word "transition" has been so present in my life lately is precisely because I'm not in a developmental moment. The transition occurring in my soul is the transition of daily life. Can you sense a tension in your soul... not a bad tension... but a tension between what was and what is being called forth TODAY? I feel it all the time. I feel it as I scroll through my various news feeds and on social media. I feel my soul wondering, "What am I being called to do here? How am I being called forth to engage in the world at this particular moment in history?" I feel it as I continually seek to be a better parent. I feel my soul stretching, "Is there another way to handle this situation? What does my child need in this particular moment to help her grow into the strong child of God that I know her to be?" I feel it as I navigate relationships of various kinds. I struggle mightily to figure out, "What are the right words to say here? How can I best respond to this situation?" I was recently at the Milwaukee Public Museum with my family. As we typically do, we started our experience in the museum by wandering through The Streets of Old Milwaukee and generally having a fun time exploring local history. And, eventually, as we often do, my daughter and I made it down to the butterfly pavilion. This is NOT my favorite place. The butterfly pavilion has live butterflies flying around and, although the goal for my daughter is always to have one land on her, the butterflies actually kind of creep me out. 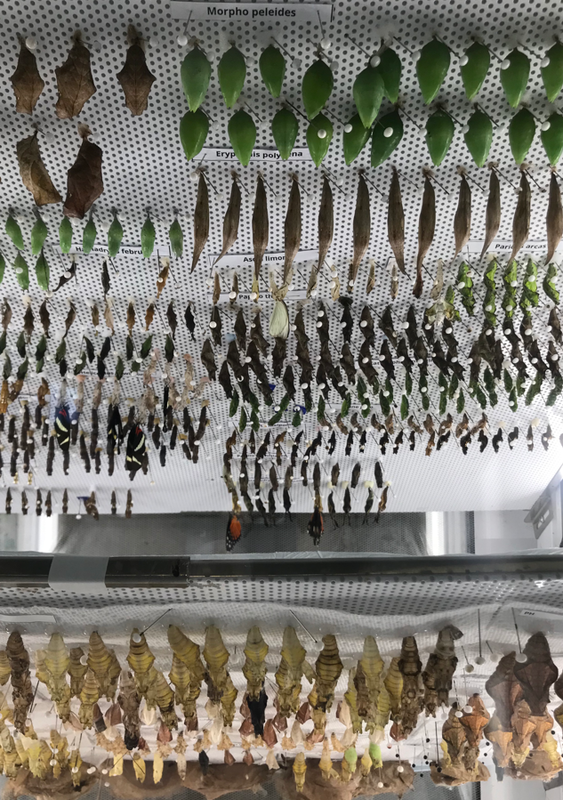 However, on this visit, for the first time, I saw a display of actual, active, cocoons that were in the midst of their transition from caterpillar to butterfly. I had never noticed this display before. And let me tell you: they are not pretty. The truth is: these transitions that I'm experiencing are not monumental moments. These transitions of daily life are not the moments of getting a driver's license or getting married or divorced. They are not the cocoons of big becoming. Rather, they are often small and insignificant. So insignificant, in fact, that they can be overlooked. But when noticed as opportunities of transition, these small moments can suddenly feel huge. At least, they feel huge to me. When I become mindful of the many opportunities for daily transition in my life, I find the need to summon immense courage to live into them... and that can feel ugly, just like those cocoons. It takes tremendous courage to be aware of one's context, to be guided by the Holy Spirit, and to take one more step into becoming... even when it's uncomfortable. The transition of daily life is not made up of monumental personal milestones, like a cocoon is in the life of a butterfly. But rather, these small daily transitions from who I was to who I am called to be, can have monumental impacts on our collective experience. We have the opportunity in each of these transitional moments, throughout our days, to bring more love into our relationships, into our neighborhoods, into our workplaces, and into our shared civic spaces. What are the ways that you are being called into the transition of daily life? Can you identify ways of being that no longer fit your present reality? What can you do to begin moving beyond them? Where is your sphere of influence? How can you bring more love into those spaces?